Each October, the Department of Labor’s Office of Disability Employment Policy (ODEP) sponsors National Disability Employment Awareness Month (NDEAM) to celebrate the contributions of workers with disabilities and educate organizations on the value of a diverse and inclusive workforce. This year’s theme is “Inclusion Drives Innovation,” a reminder of the advantages of creating a culture where all employees — and their ideas and experiences — are valued and respected, regardless of their physical or mental disability. While much progress has been made since 1945, the year Congress designated “National Employ the Physically Handicapped Week,” disability discrimination remains one of the most common forms of workplace discrimination and harassment. In 2016, there were 28,073 charges of disability discrimination filed through the Equal Employment Opportunity Commission – 30.7% of all workplace discrimination claims. There is also a large gap in hiring individuals with a disability. In August 2017, only 20.5% of people with disabilities participated in the labor force, compared to 68.8% of people without disabilities, according to the US Bureau of Labor Statistics. 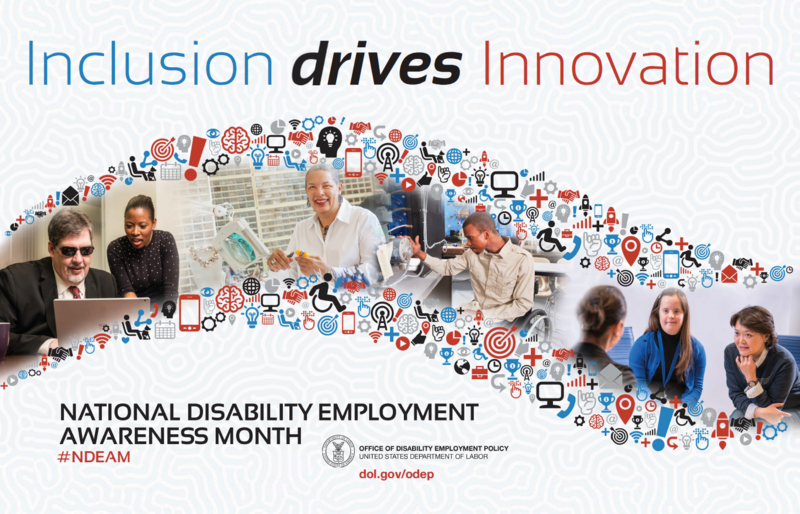 Take advantage of NDEAM to launch a series of disability employment awareness activities and create a foundation for 11 more months of promoting disability inclusion. If your organization doesn’t have a disability-related Employee Resource Group (ERG), consider starting one. Its members can help you brainstorm activities, speakers and topics to include in your awareness-building efforts. ERGs can also serve as a talent pipeline for referring qualified candidates with disabilities. One of the best educational events you can provide employees during NDEAM or anytime is a “Disability Employment 101” primer. The Job Accommodation Network (JAN) offers a series of free, training modules on a variety of disability-related topics. Disability Mentoring Day promotes career development for youth with disabilities through hands-on programs, job shadowing and ongoing mentoring. The nationwide observance is the third Wednesday of each October. The American Association of People with Disabilities offers information to assist you in implementing a Disability Mentoring Day. Host a series of monthly “lunch and learn” events for employees to learn about a range of disability-related subjects. After each session, survey attendees gather feedback and solicit ideas for new topics and speakers. Consider sponsoring opportunities for your staff to volunteer at local organizations that prepare people with disabilities for careers by reviewing resumes, conducting mock interviews and providing guidance on grooming and dress. These opportunities are productive ways to give back, raise awareness and help you recruit talented job candidates with disabilities for your own organization. An easy way to raise awareness is by posting this year’s NDEAM poster, available in both English and Spanish, in your break room and other common areas in the workplace. Employees who are consistently reminded that their organization is disability-friendly may be more likely to refer job-seeking friends with disabilities to your organization. If you offer employee development and training opportunities, consider adding American Sign Language (ASL) classes to your offerings. It’s fun, teaches employees new skills and reinforces relationships between hearing employees and those who are deaf. ASL classes can also strengthen internal communications for your employees who are deaf, and improve your ability to recruit talented candidates who are deaf or hard of hearing. Take advantage of your formal onboarding process to educate new employees on your policies, training and practices related to disability inclusion. National Disability Employment Awareness Month (NDEAM) is an annual awareness campaign to promote a disability-friendly workplace and highlight the important role that different perspectives play in successful organizations. NDEAM is also a great time to consider new ways to cover disability discrimination in your diversity and inclusion and anti-discrimination training and policies.